According to scientific research, the health and capabilities of young people have declined over the last few decades, partly due to lifestyle changes and the lack of physical outdoor challenges designed for their age group. Today, young people find inspiration and amusement within the gaming world and the concepts of the digital universe. 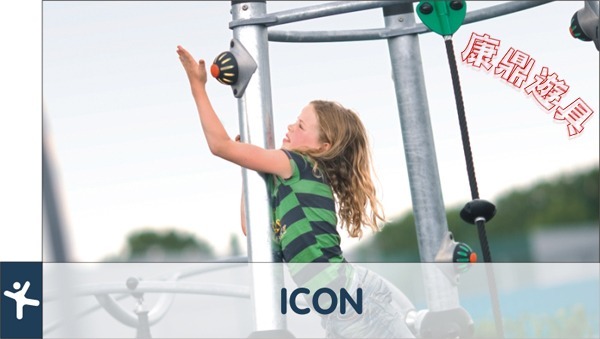 On this behalf, KOMPAN introduces ICON, the future play for young people: a captivating new magnetic space based on gaming, sport and interaction. The combination of friendly competition, social interaction and fun, physical activity enables adolescents to work on their social skills through team building, and improves their physical capacity in terms of strength, speed, reaction, coordination, energy and willpower. The ICON system consists of four different ICON products, Space, Swirl, Nova and Rocky, plus the ICON Game Server which ensures that the games run correctly, and all parts are easy to install and replace. The multi-climate, waterproof equipment is designed and developed to fulfil all the relevant product safety standards as well as KOMPAN's own safety policy. In other words, ICON's vandal-resistant materials are the safest and the most durable available, and the system is created with minimum maintenance in mind.